Bicolored Cats, white cats patched with another color, are plentiful in every neighborhood, but the uppercrust, pedigree, version is much more rarely seen because of the difficulty of meeting the breed standard. The white should cover no more than half the coat, and the second color no less than half and no more than two-thirds. Ideally, the patching should be symmetrical, but in practice this is rarely possible to achieve. 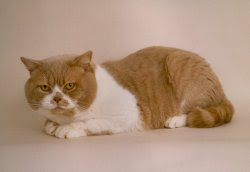 Perhaps surprisingly, in view of the large numbers of non-pedigree bicolored cats that have existed for as long as the domestic cat itself, the British Bicolor has only recently been recognized for sowing. This is an eminently even-tempered, friendly, and intelligent cat. There are four variety: Black-tempered, friendly, and intelligent cat. Before pedigree lines were introduced, the most well-known bicolored cat was one owned by the Earl of Southampton, a friend of Shakespeare. A contemporary painting shows them doing “time” together in the Tower of London. - The fur is short and dense. Color should be white evenly patched with blue. - There should be no white hairs visible in colored patches. The paws are large and round with pads that are either pink or that match the color of the patches. Round and broad with a short, straight nose that should have a nose pad that is either pink of that matches the color of the patches. - Face should be patched. - A white facial blaze is a desirable feature. Large, round, and copper or orange in color. Green rims are a fault. From a back view of the blue-and-White Bicolor, only one small, white spot mars the symmetry of the patching. Undeniably pretty as adults, the kittens of the breed are truly irresistible. The Cream-and-White is the most uncommon of the varieties, all of which tend to mature early. Although very appealing in its own right, this cat’s tabby markings rule out a career on the show bench.